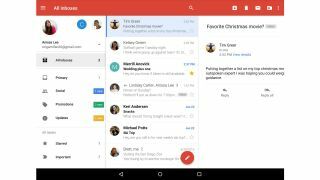 Google's latest update to its Gmail app for Android devices brings a unified inbox so you can view emails from multiple accounts at the same time. "Starting today you'll be able to view all your mail at once, regardless of which account it's from, using the new "All Inboxes" option," Google announced. "This way you can read and respond to all your messages without having to hop between accounts." The unified inbox is a convenient feature to triage email if you have multiple accounts to check. Business customers and consumers will no longer need to switch between different accounts to see their emails within the Gmail app. The Gmail app supports emails from Yahoo, Outlook, and other services. These features help to bring Gmail up to par with the pre-installed email clients on Android devices, third-party email clients from the Google Play Store and Microsoft's new Outlook app. Additionally, to make it even more convenient for non-Gmail users to use the app, Google now brings threaded conversation view to Yahoo and Outlook mail. With the threaded messages view, related emails with the same subject line are grouped together in a single conversation, making it easy for users to follow all the replies. Google is also improving its auto-complete feature to make it easier to find what you're looking for. "The new Gmail app for Android has better auto-complete, so you can find what you need even faster," Google said. Other new features include responsive animations, larger attachment previews and the ability to save files to Google Drive with a single tap. The update is available today from the Google Play Store, but it may take a while to get pushed to your Android devices.